The goal of THE MILLER BASKETBALL FEEDER PROGRAM (grades K-8) is to help every boy develop the necessary skills and character in order to one day be a VARSITY MILLER BASKETBALL PLAYER. The Miller basketball program offers shooting and fundamentals camps each June for grades kindergarten through second. 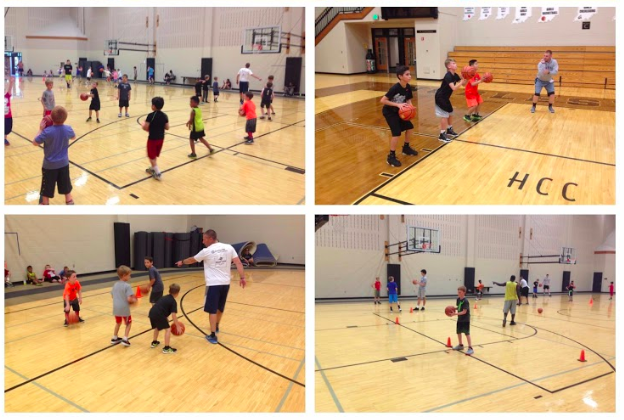 The MILLER BASKETBALL ACADEMY focuses on training boys in grades three through six, and the MIDDLE SCHOOL PROGRAM focuses on grades seven and eight. Fundamentals – The MBA will focus on teaching the necessary skills to become an excellent basketball player. Proper technique for shooting, dribbling, passing, catching, pivoting, ball handling, cutting, screening, rebounding, and defending will be emphasized. In addition, players will be introduced to the Noblesville H.S. varsity system, learning practice drills, offensive and defensive concepts, and terminology that is used at the NHS varsity level. Passion for the Game – The MBA wants to engage and inspire each player so that he will develop a love and passion for the game of basketball. This passion will drive him to become the best basketball player he can be. A player who loves the game will continue to improve his skill level through years of repetition and then will potentially one day play varsity basketball for the Noblesville Millers. Character Development – The MBA will emphasize the development of both performance and moral skills through playing the game. Performance skills such as hard work, competitiveness, accountability, confidence, discipline, and resiliency will be emphasized. Moral Skills such as unselfishness, honesty, respect for others, humility, loyalty, and trustworthiness will be emphasized. August – September: The MBA will offer six skill sessions (approximately 1 per week) in August and September. Tryouts will be held in August. All skill sessions and tryouts will be held in Noblesville School gyms. October – March: MBA teams will have two (2) 90 minute practices per week. The practices will be held within Noblesville School gyms. In addition to team practices, a minimum of two skill clinics will be offered each month. Each team will play between 25-30 games. Most of the games will be played in the greater Hamilton County area, including Noblesville, Fishers, and Carmel. Some of our teams will play games around the 465 loop in Indianapolis. April – May: The MBA will offer 3-4 skill sessions (approximately 2 per month). The key to a state championship high school program is developing a quality feeder program in grades K-8. The high school, middle school, and elementary school coaches will be instructed by Coach Brian McCauley in order to understand the expectations for each grade level.